Motor vehicle accidents remain the number 1 direct cause of death among teenagers. Males, who are twice as likely to die in motor vehicle accidents. Teens driving with teen passengers. 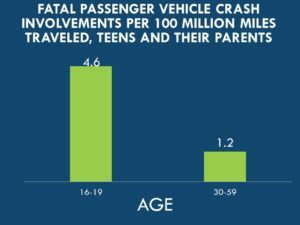 The risk of a fatal accident is dramatically increased by the addition of other teenagers as passengers in the vehicle. Newly licensed teens. Crash risk is particularly high during the first months of licensure. 16-17 year old drivers have 3 times the crash risk as 18-19 year olds. NEXT: WHAT PUTS TEENAGERS AT RISK? *Sources: Centers for Disease Control; Insurance Institute for Highway Safety.